While MTM technically stands for “Midwoofer—Tweeter—Midwoofer,” you ought to know that they’re good from Mixing-To-Mastering. The MTM speaker configuration allows the MTM studio monitors to deliver the widest stereo field available in their class. You get a more consistent listening experience from varied listening perspectives. They’re also louder than they look, since the combined signal of the two relatively small drivers propagates forward like a single waveform. This mutual coupling provides a highly dynamic output in a compact footprint. And if footprint’s not an issue, mount them horizontally. We’ve designed them to sound just as good in either configuration. Check out this video from A-list producer Chaka Blackmon. He relies on the Eris E66s for his daily grind. 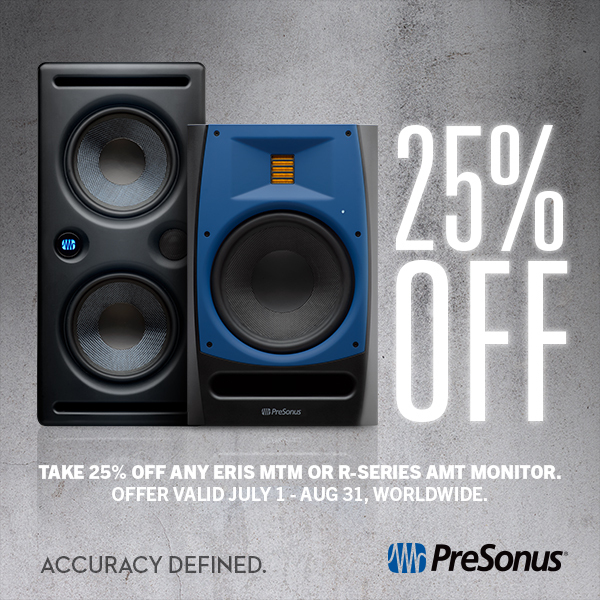 The R-series contrasts from the MTMs in a couple ways. While the singular woofer approach is a more traditional, the Air Motion Transformer (AMT) tweeter is the star of the show. At the core of AMT is the astonishingly thin (< 0.01 mm!) Kapton® membrane voice coil, which moves at the same instant as the current that drives it, with no dampening applied to negatively affect the tweeter’s transient response time. As a result, the R-Series faithfully reproduce the highest frequencies that can be heard by the human ear—and the vast majority of human microphones. The sonic result is a greater sense of air, space, and imaging that is characteristic of audiophile recordings and off-the-charts transient response. Furthermore, the AMT’s design inherently offers 8 to 13 times the projection area of a typical dome tweeter. This widens the stereo image considerably, while keeping problematic vertical dispersion in check. Consequently, the R80s sound consistent regardless of what room you place them in; a versatile choice for audio recording studios and post-production. Here’s Mike White on the R-series. Finally, both the R-series and the MTMs offer all the Acoustic Space tuning and connectivity options you’d ever need, and include RCA, 1/4″, and XLR inputs.